WARNING: This piece is a shameless attempt to distract you from the world of precious metals, finance, economics and geopolitics to draw attention to a ‘strictly human interest’ story. Please do not make ANY decisions, let alone investment ones, based on the information presented. This is purely for entertainment purposes. Politicians and governments garner favor, popularity and support from their constituents in different ways. Some favor populist measures, such as tax breaks or benefit ‘giveaways’ to citizenry, subsidies and social entitlements – be they cash transfers or fuel/food price controls. Thus it has been since at least the days of Rome (and erudite readers can no doubt point to much earlier instances), when panem et circenses (bread and circuses) became a part of everyday parlance. When such measures prove inadequate to generate sufficient fervor due to, say, overwhelmingly deteriorating economic conditions, or when civil liberties and human rights are being systematically curtailed, or when war is deemed necessary (or all three of the above), the specter of an external, powerful enemy and its act of outrageous aggression and villainy almost magically materialize EVERY SINGLE TIME. Some 'fringe' students of history may even point to incidents where acts of sabotage and violence may have in fact been either carried out or 'gently encouraged to happen' by agents of various government actors. This in turn justifies not only immediate and extensive government (re)action -- but a mechanism by which this can be done to the cheering on by at least a tacit majority of the population. But in the end, both of the above avenues are rather costly. Social benefits cost taxpayer money, wars cost lots of money AND taxpayer lives (though numerically this latter has gone through a deflationary bias in recent decades, at least on the Western side). Wars mean that energy supplies must be expended, geopolitical power must be put at risk. Even via close central planning and policies of total spectrum of dominance, wars introduce elements of chance and unintended or at least poorly controlled consequences. It is a great and mighty tool in the toolbox of the ruling bodies, but ultimately a resort for special, truly deserving occasions. The method for influencing popular opinion with the greatest ROI, great scalability (to a limit), lowest cost of entry, fewest distortions of economic systems (unless so desired, of course) and lowest ratio of unintended consequences: pure, uncut and mainlined propaganda. This of course must also be liberally applied as part of BOTH avenues above, and so remains a constant garnish (some might even say determinant) of public discourse about the performance and likeability of governments. Page 1: “THE conscious and intelligent manipulation of the organized habits and opinions of the masses is an important element in democratic society. Those who manipulate this unseen mechanism of society constitute an invisible government which is the true ruling power of our country. Last page: “Undoubtedly the public is becoming aware of the methods which are being used to mold its opinions and habits. If the public is better informed about the processes of its own life, it will be so much the more receptive to reasonable appeals to its own interests. No matter how sophisticated, how cynical the public may become about publicity methods, it must respond to the basic appeals, because it will always need food, crave amusement, long for beauty, respond to leadership. If the public becomes more intelligent in its commercial demands, commercial firms will meet the new standards. If it becomes weary of the old methods used to persuade it to accept a given idea or commodity, its leaders will present their appeals more intelligently. So it is with this lengthy preamble that I present to you what it looks like when efforts to sway the populace are executed with the most stringent care taken to safeguard shareholder return on investment in deploying funds. С Днем Рождения , товарищ Путин. 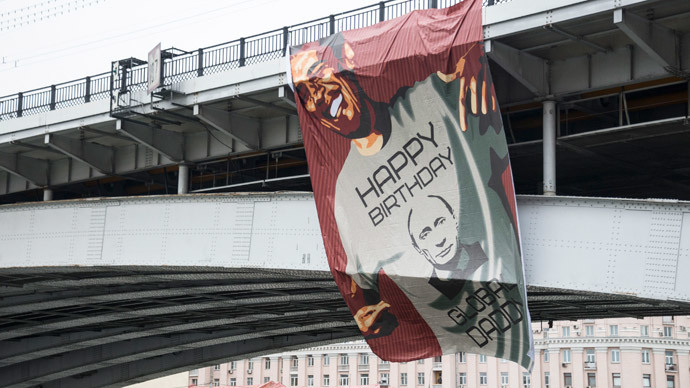 Happy Birthday, Comrade. "С Днем Рождения, Президент России" - поют "ХИТрюшки"
While most of the photos below are from Martin (aka George Malets?) -- (please take a moment to peruse the author's blog, many more can be found there), the story was also covered in Radio Free Europe, ABC News and even the WashPo -- along with any number of media outlets decrying the sheer cult of personality on display. Putinwear and iPutin at the GUM: "GUM always was and remains the greatest country’s store." “The graffiti on the facades of apartment buildings spell out the words: Sovereignty, Memory, Arctic, Strength, History, Safety, and Olympics. The first letters of these words (Suveritet, Pamyat', Arktika, Sila, Istoria, Besopasnost, and Olimpiada) also form the word thanks (spasibo) in Russian. Altogether they appeared on walls in Moscow, St. Petersburg, Novosibirsk, Vladivostok, Irkutsk, Kaliningrad, and Sevastopol. “Julius Kasinskis, owner of the 'Peacemaker Shop' (English): "It's all about the idea of people portraying Putin as a different person. And my idea of him is totally different of what I hear as common knowledge, especially in the United States. " But the TRUE Pièce de résistance was (at least to me) truly remarkable. As a matter of fact, it was the primary reason for wasting your time with such a fluff piece of a post in the first place. I am literally left speechless, and would invite readers to propose analogies for similar celebrations that were (or SHOULD HAVE BEEN) held for imperial political leaders who so successfully and humanely pacified earlier 'tensions' in distant provinces, and brought prosperity to the grateful inhabitants of said lands. And there you have it, ladies and gentlemen. Birthdays are naturally occurring opportunities to fortify and enhance the popular image of beloved leaders. I, for one, gladly welcome the fact that our wise and benevolent overlords/puppets statesmen have now grown to “present their appeals more intelligently”. “CBS White House reporter Mark Knoller is the unofficial but widely trusted chronicler of data on presidential travels and other day-to-day White House goings-on, so we turned to his calculations. Do you really want to follow Steve's example and run your mouth same as last year when you made it perfectly obvious that you were not watching Reagan's speech supporting Goldwater while being stationed @ Camp Hansen on Okinawa, and praying to the Almighty that America would WTFU and listen, ergo assumed that such was broadcast in B&W DECADES later, or did you actually learn from that particular experience, and consider that it may be infinitely wiser to STHU, first ASK 'Ol Rex, why Steve's naïve extrapolations are in error, and actually listen so that you & yours' might benefit? Although I am just as willing as other Turdites to “give” considerably “more than I take” here at TFMR, and help others overcome and discard their ignorance, I sure as hell am not going to waste any time beating a dead horse in a futile attempt to fix stupid.